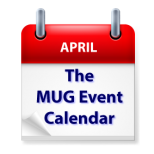 This week’s MUG Event Calendar is full of some great names and some great presentations. Bryan Chaffin of The Mac Observer will visit one California group, and Digital Artist Burt Monroy will be checking in at another, while Steve Sande of Apple World Today will make a virtual visit to a Virginia group. iCloud is on the agenda in New Jersey, organization in Hawaii, and an annual auction in Pennsylvania. Wednesday 20-Apr Central Oregon Mac User Group – Already into 2016!